A property’s market value is typically higher than its assessed value. Houses are valued for different purposes. Counties collect money from homeowners as real estate taxes that are calculated, or assessed according to the properties tax values. In contrast, a buyer and seller of a home must agree on a transaction price before they can consummate the sale. That agreed-upon price is the property’s fair market value that depends less on its assessed value and more on the state of the real estate sales market. A property’s market value is the amount of money that a knowledgeable and willing buyer will offer to a knowledgeable and willing seller who will accept it when neither party is pressured to do so. Such sales are often referred to as arms length transactions because they do not include family members, for instance, who might enjoy sweetheart deals that are unavailable to the general public. They also do not include transactions where the seller is desperate, or motivated to sell in order to raise emergency capital. A fair market value is influenced by a property’s number of bedrooms, updated kitchens and bathrooms, type of heating, and the like, as well as its curb appeal defined by its architectural style, lot size and landscaping. It fluctuates according to its geographical location and changes according to its demand in the prevailing real estate market. A property’s assessed value is the value placed on it for tax purposes. Counties collect real estate taxes from homeowners that are calculated on the tax values of their properties. They are not determined by the economic forces of supply and demand but rather by counties fiscal requirements. Counties estimate the money that they must collect from homeowners to pay for county expenditures that are not covered by other revenue streams like fees, licenses and the like. In most municipalities, assessed values are then adjusted accordingly and tax rates are determined and collected from homeowners. 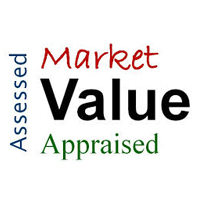 If you are looking for the market value of a property, a certified residential real estate appraiser is your best option. Real Estate Appraisers research recently sold sales similar to the subject and make market derived adjustments for differences between the subject property and the comparables. They will usually combine this “Sales Comparison Approach” with a second method such as the “Cost Approach” (cost of construction minus depreciation, plus land) and/or the “Income Apprcoach” (used for properties that produce income) to determine value.